Large emergency facilities are alike, however every small rural emergency facility works in its own way. Much is in confusion in rural emergency care. Each town has challenges, resources, and available clinicians that differ from their neighbours. Old ways are under pressure but a new model, to draw together hospitals, ambulance services and clinicians, has not been built. Fortunately, there are many ideas. Some of them are tested, some untested, and some even revolutionary. This conference showcases these potential building blocks of a safer, more efficient, and sustainable rural emergency care system. You should attend if you have a story of a hard-won success or learnt from a hard-fought failure. You should attend if you have run out of ideas and can’t decide where to go next. You should attend if you have an idea that just might work, but you are worried it is so crazy that some will laugh. You should attend if you have research about rural prehospital or emergency facility care to present. Submit an abstract, and you will be heard. Your idea will be discussed. Attend to hear the ideas of others. They may spark something new for you, and your question may provide a perspective on something that we have all been missing. CREM is delighted to announce that our director, Dr Timothy Baker, has been awarded the South West Regional Achiever Award, 2016. This award is a great honour and reflects the contribution, not only of Dr Baker personally but of many other people and organisations who contribute to rural emergency medicine in our region. The staff of CREM research issues of importance and help spread new ideas to clinicians in small towns. Warrnambool and Portland emergency departments, and the surrounding Urgent Care Centres continue to incorporate new models of care to provide the best outcomes for their patients. CREM appreciates the ongoing funding and commitment of Alcoa Australia, the Victorian Department of Health and Human Services, and Deakin University to the South West Region. 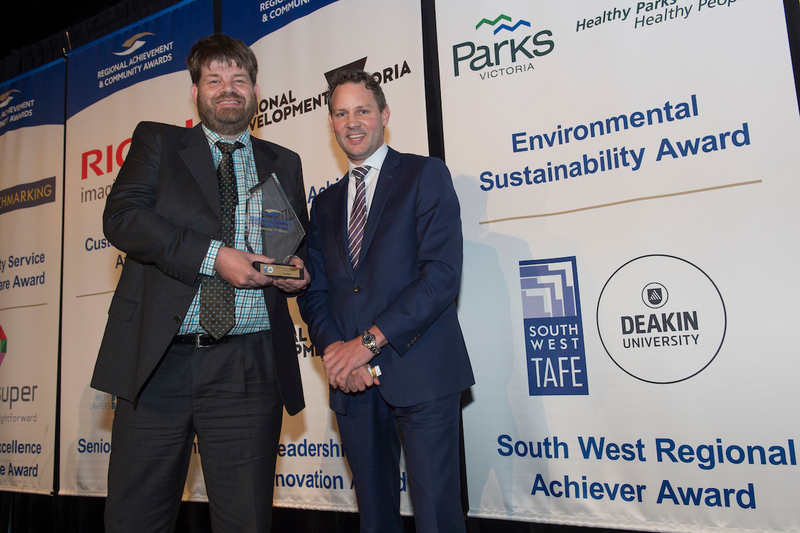 CREM would like to thank the sponsors of this award, South West TAFE and Deakin University, for recognising and honouring those who work for their communities in the South West Region of Victoria. Dr Baker would like to congratulate the other finalists and nominees in this category, who have all contributed greatly to the local communities, making our region such a wonderful place to live. Thanks to Prime 7, The Weekly Times and the Bank Of Melbourne, the major sponsors of these awards. Through a new series of hand-tinted photographic prints and video works, she documents human-made spaces designed to promote privacy, sterility, surveillance and production. This spans a hospital emergency department, a morgue, an oil refinery, a coalmine, a power station and a prison. Welcome to your medical student Emergency Medicine rotation. You may feel very familiar with emergency medicine. It is a staple of prime-time television drama, and you will have almost certainly visited the emergency department during your previous rotations. Other specialists may have given you their opinion, not always flattering, of the emergency department. We hope that while you are with us, we will deepen your understanding of emergency medicine, and help you learn skills that will help you throughout your medical career. There will certainly be emergencies. On any shift, you could suddenly be a practical part of a team that is striving to save a patient’s life. You will learn the basics of keeping a patient alive. But you will also find that critical care is not the only part of emergency medicine. It is not even the most difficult part. Emergency medicine deals with undifferentiated illness. By the time a patient reaches the inpatient ward, they often have a label of pneumonia, angina or appendicitis. In the emergency department they had shortness of breath or abdominal pain. Emergency medicine is a diagnostic specialty. Most of our time is spent trying work out who is really sick, without taking too much time or ordering unnecessary tests. The most stressful aspect of emergency medicine can be deciding whether to send home a patient with a headache that is probably a migraine, but just might be a cerebral haemorrhage. The emergency department is also where the hospital meets the community. On a single day you may speak to general practitioners, specialty units, community teams, health administrators, paramedics and the police. The stresses on the health system are often most obvious here. You will see how people move between various areas of health care. You will see how they can end up in the emergency department when they fall through the cracks. You may also see how the stresses of shift work and time pressures affect you. In these few weeks, you will perform many practical skills for the first time. Minor procedures are common in the emergency department. You should have practiced these tasks in the skills lab, but performing procedures on real people is different; they feel pain, they move, their anatomy is unique, and they may ask you to stop. Practicing procedures on patients will make you feel uncomfortable. To become a practical doctor you must become comfortable with being uncomfortable. We will be here to help. You are part of the team, and performing procedures, if consent is given, that the patient needs. It gets easier. You need to become comfortable with the basic skills, so that when you are an intern you can become uncomfortable again with even more advanced tasks. So welcome again to your emergency rotation. It might not be what you expect, but it may be what you need. A 2015 alcohol screening pilot project undertaken at South West Healthcare Emergency Department has contributed to the awarding of a $1.5M research grant. The Federal Government’s National Health and Medical Research Council (NHMRC) has announced South West Healthcare is part of a winning consortium to deliver the Driving Change: Using Emergency Department Data To Reduce Alcohol-related Harm pilot to emergency departments throughout Australia. SWH’s share of the funding will be approximately $100,000 over five years. The NMHRC is Australia’s leading expert body for supporting health and medical research; developing health advice for the Australian community, health professionals and governments; and providing advice on ethical behaviour on health care and in the conduct of health and medical research. Becoming the recipient of an NMHRC grant is incredibly prestigious. Joining SWH, the winning consortium includes Deakin’s Centre for Social and Early Emotional Development (SEED), Vincent’s Hospital Australia (Melbourne and Sydney), the Australasian College for Emergency Medicine, Australian National University, Barwon Health, Calvary Health Care ACT, Monash Health, University of New South Wales, and Cardiff University. SEED’S Professor Peter Miller will lead the five-year project based on an international model that has shown to substantially reduce violent crimes, street assaults and hospital admissions related to alcohol. Building on the international evidence and pilot data gathered from Warrnambool and other Australian emergency department sites last year, he will oversee and evaluate an intervention that aims to reduce alcohol-related injury in the community through a randomised trial in eight emergency departments in Victoria, NSW and the ACT. A key aspect will be the introduction of mandatory ’last-drinks’ data collection within existing hospital IT systems that identifies areas of problem drinking. ‘Driving Change: Using Emergency Department Data to Reduce Alcohol-related Harm has the potential to improve the wellbeing of Australians,’ says the Director of the Centre for Rural Emergency Medicine’s Dr Tim Baker, who was heavily involved in last year’s pilot. According to the Australian Institute of Health and Welfare, over the past decade the number (from 40,000 – 60,000+) and rate (from about 200 – 270 hospitalisations per 100,000) of alcohol-related hospitalisations have risen annually. SWH’s 2015 research highlighted the growing problem of ‘pre-loading’ – drinkers consuming vast amounts of (cheaper) alcohol at home before heading out to a licensed venue. The eight-month study asked people presenting with injuries at the Emergency Department whether they’d consumed alcohol in the 12 hour lead-up to their injury, and where they’d bought the alcohol they had at home before heading out for a night on the town. The research also revealed Warrnambool’s May Racing Carnival is the peak time for alcohol-related injuries. Paramedics are required to make a variety of decisions regarding their patient, not only on the patient’s condition and course of treatment but also on the destination medical facility for further care. The objective of this study by Kate Kloot was to describe the initial destination hospital of paediatric patients transported by Ambulance Victoria paramedics within the South Western area of Victoria to determine the proportion of patients that bypassed their closest hospital. It found that almost 20% of paediatric patients were not transported to the closest hospital,  paramedics focused on patient condition and the distance to a larger hospital when choosing destination, and uncertainty regarding 24 hour availability of resources at smaller hospitals contributed to longer transports. Kloot K, Salzman S, Kilpatrick S, Baker T, Brumby SA. Initial destination hospital of paediatric prehospital patients in rural Victoria. Emerg Med Australas. 2016;28(2):205-10. The scaphoid is the most frequently fractured carpal bone and accounts for a significant portion of presentations in the emergency department. Managing the patient in the emergency department with the help of an acute magnetic resonance imaging (MRI) allows early correct treatment and saves the patient wearing a splint unnecessarily if the scaphoid is not actually fractured. This study by Tamika Kelson from South West Healthcare, Rob Davidson of the University of Canberra, and Tim Baker of CREM compared cost-effectiveness and patient impact for early MRI-based management and conventional management of occult scaphoid fractures in a rural setting. The study found that MRI dramatically reduces the amount of unnecessary immobilisation, time of treatment and healthcare usage in a rural setting. It decreased societal cost, while the cost to the rural healthcare service was equivalent with either MRI or traditional approaches. Kelson T, Davidson R, Baker T. Early MRI versus conventional management in the detection of occult scaphoid fractures: what does it really cost? A rural pilot study. J Med Radiat Sci. 2016;63(1):9-16. Rural doctors often have specific training for rural emergency medicine. What they lack for difficult cases is immediate access to onsite specialist advice. Unfortunately, telemedicine programs are often designed to meet the needs of specialists rather than rural doctors and their patients. This editorial by the Director of CREM, Tim Baker, outlines the view of advice lines and telemedicine programs from the perspective of the rural doctor making the call, and makes a plea for a more coordinated approach. Baker T. Providing a lifeline for rural doctors. Medical Journal of Australia -1 Nov 23 2015, Oct 5;203(7):277. Warrnambool Base Hospital will receive a $500,000 boost to help its emergency department better respond to patients affected by alcohol and drugs, such as ice,Premier and Member for South West Coast Dr Denis Napthine announced today. Dr Napthine said the local emergency department would now decide which new resources will best suit the needs of the local Warrnambool community, which could include hiring a new specialised alcohol and drug specialist or additional training for existing staff. The initiative builds on the successful initiative announced in the 2012-13 Budget that provided 21 health services, including six regional health services, with additional resources to respond to alcohol and drug-affected patients. The additional funding announced today follows the $5.7 million, 5.4 per cent increase to the 2014-15 South West Healthcare budget announced earlier this month. “Since coming to Government, the Coalition has been proud to deliver a $26.7 million, 31.4 per cent boost to the South West Healthcare Budget,” Dr Napthine said.